An MRI performed Saturday on Alfred Aboya's knee did not reveal any new injury and he is expected to play against USC tomorrow. He practiced yesterday and today without any pain or problems with the knee. Aboya left the game against Washington on Saturday after feeling a twinge in his knee during a play. Aboya missed the first six games of the season after having surgery on both knees during the offseason. Coach Ben Howland had considered re-inserting Aboya back into the game during the second half against Washington because Aboya felt better but chose not to due his knee injury history, and Howland wanted to have an MRI completed first. The Bruins received more positive news on the injury front. Red-shirt senior forward Cedric Bozeman, who missed the Bruin's first six Pac-10 games with a shoulder injury, was cleared by team physicians to resume shooting and dribbling this week. He did not experience any pain after a shooting session this week. It has not been determined whether Bozeman will be able to return this season. He will continue his rehabiliation, and a final determination on his playing status will be made in a few weeks. 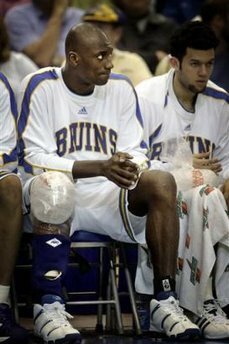 Bozeman, who hurt his left shoulder in a collision with Josh Shipp during a practice, was averaging 10.3 points, 4.0 rebounds, and 2.2 assists per game before his injury. He was shooting 53% from the field and 45% from beyond the 3-point line.